Size doesn't matter. But it helps. The co-op puzzle game Tiny Brains, which totally doesn't sound like a cross between The Lost Vikings and Pinky and the Brain, finally has a confirmed release date. On November 15, fire up your new PS4 or trusty PC and get ready to download. 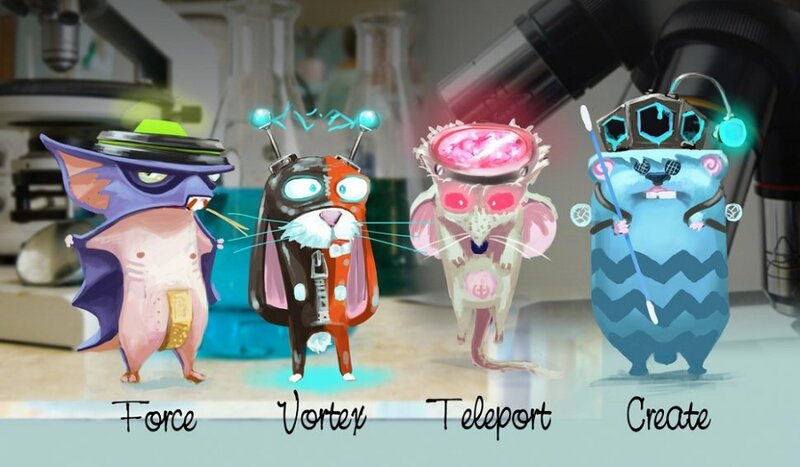 In Tiny Brains you and your co-op buddies play as four lab creatures who have been experimented on so long that they develop super powers. They're all trying to escape from a mad scientist's experiments, but each level is like some sort of demented maze, complete with multiple solutions that can be reached depending on how you work through the puzzles. Each critter has a special ability that helps the team survive. For example, Force uses telekinesis to shove things around while create makes walls of ice. Teleport swaps positions with objects, and Vortex pulls things towards himself. Fairly rudimentary abilities, for sure, but using them in concert becomes an exercise in team-based puzzle solving. Tiny Brains is Spearhead Games' first release. The group contains former members of the Assassin's Creed III, Army of Two and Dead Space teams, meaning they know what they're doing when it comes to making a game. They created Tiny Brains knowing it was a project a larger studio would never take a risk on. Judging from the features list, though, we're thinking it's a risk well taken. Look for Tiny Brains in mid-November on PSN and PC. An Xbox 360 release should come at a later date. The game features both local and online drop-in multiplayer, a full co-op campaign, and additional challenge and competitive modes.